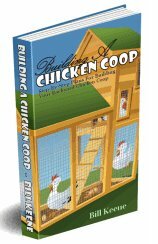 Chicken Coop Plan 2: Build a Backyard Chicken Coop, by Bill Keane. So how do these plans stack up against the criteria? Readability: These plans are professionally done and clear to read. The detailed instructions are provided in the sequence that construction should proceed. Comprehensiveness of the plan. These plans are thorough, and include instructions from how to situate your coop to finishing details such as constructing doors, windows and nest boxes. Detail drawings for particular pieces of construction are included. A detailed list of materials is provided. Graphics.The graphics provided with these plans are excellent, including both flat and 3D diagrams. Dimensions clearly marked with both english and metric equivalents. However there were no photos of the coop being constructed, or of the finished coop. Ease of construction. Again, I find the coops to be overbuilt; the plans will work, but I would not take the painstaking notching and framing approach suggested in these plans. However, if you treat the plans as a concept only, you can probably simplify construction and reduce your work. Bonus material.There are several bonus items included , but frankly they were not very useful. And in fact I would disagree with some of the instructions provided for caring for your chickens. You get more useful bonuses and better chicken care instructions with the first package reviewed. Overall assessment of this chicken coop plan. This would not be my first choice for chicken coop plans for the novice chicken raiser. I would give it an overall rating of 3 out of 5, not a high enough rating to consider it a good buy.